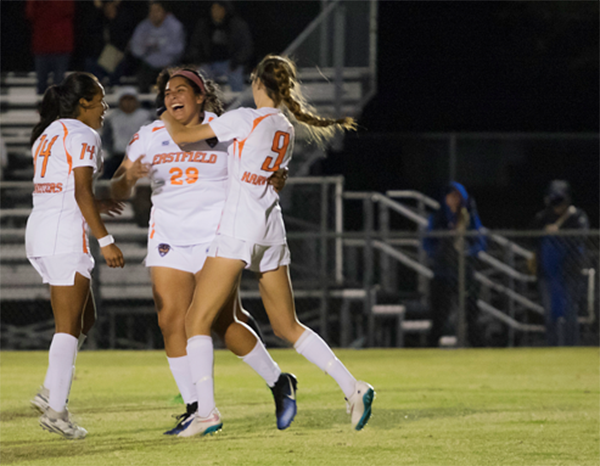 RICHLAND COLLEGE— The Eastfield women’s soccer team overcame a slow first half to defeat North Lake 2-1 in the first round of the National Junior College Athletic Association Regional tournament. Both teams had many chances to score early on. An Eastfield goal by forward Arianna Dunsworth in the 12th minute was ruled offside. North Lake had several breakaways but keeper Gabriela Roa saved much of what the defense let through. North Lake finally went ahead in the closing minutes of the first half after the Blazer’s attack broke through the Harvester defense to score the opening goal. Eastfield coach Dustin Stein said the entire defensive line had a sloppy first half. Midfielder Emily Juarez said the team played too slow while attacking and weren’t executing their possession-oriented style. The Harvesters rebounded in the second half by creating chances through the wings, with right forward Angela Lomeli heavily involved. In the 52nd minute, she forced the North Lake keeper Kayley Williams to make a full stretch save to parry the ball over the cross bar. At the hour mark, Juarez crossed the ball into the box from a corner for Lomeli to head in the equalizer. Eastfield continued to push forward and earned the winning goal five minutes later. Dunsworth rifled in a shot from outside the box to beat the keeper at her right post. Following the Harvester’s second goal, North Lake’s frontline lacked the efficiency from the first half and created little chances. Their last threat on Eastfield’s goal came from a corner, which Eastfield successfully defended. With just five seconds remaining, a North Lake player went down, stopping the play clock. The Harvesters, desperate to end the game, protested to the referee and tensions rose. When the final whistle was blown, a heated exchange between the two sides ensued. Stein said he isn’t a fan of that type of confrontation. The team will face off against Richland on Thursday at 7:30 p.m. in the semifinals of the tournament. Juarez said she expects a good game between the Thunderducks and Harvesters.